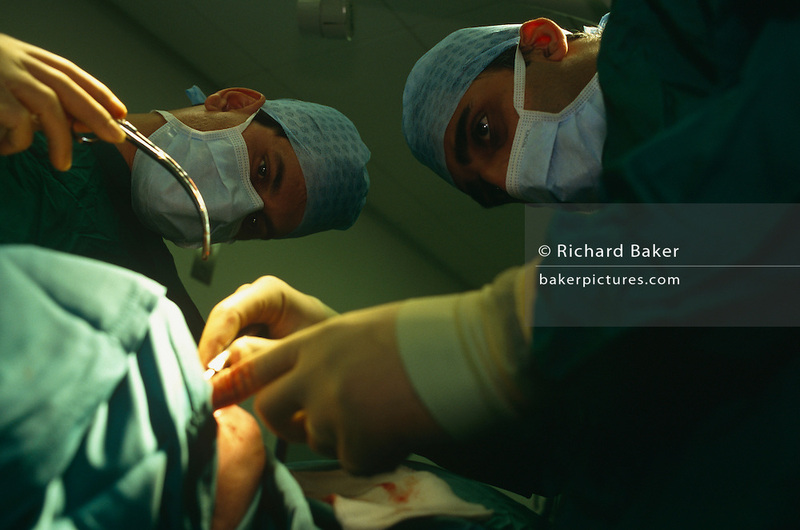 We are looking upwards into the faces of two surgeons wearing medical masks and surgical gowns as they carry out a wisdom tooth extraction procedure at the famous St. Bartholomews (Barts) Hospital in London, England. With eyes focussed on their work, the two health professionals are intently looking into the mouth of their patient who is covered in clean green sheets but remains unseen to the viewer. Strong operating theatre lights shine down on to the patient and we see the men's gloved hands reaching carefully, avoiding infection or bacterial problems like MRSA. Barts is Britain's oldest hospital - founded in 1123 - and boasts a progressive policy of encouraging day-surgery for out-patients allowing patients to return home soon after their minor operations.